Universities that conduct research on agriculture provide excellent resources for farmers on how they can increase efficiency and productivity. Most universities have an extension or outreach page on their website that provides free information for farmers. Here are some examples of valuable resources available at leading agricultural science universities. Washington State University has partnered with Washington state farmers to improve productivity and efficiency of products. Practical recommendations for using soil moisture sensors to improve an operation. Basic information for getting started with drip irrigation and how to calculate drip application rate. The Kansas State University Agricultural Experiment Station and Cooperative Extension Service has been working on farming issues for 100 years. Essential information to know about subsurface drip irrigation. An article discussing factors that influence irrigation runoff. The University of Arizona’s Cooperative Extension provides information on a wide range of topics including sustainable agriculture, irrigation, and drought. Information on things to consider when selecting a measuring device for irrigation. An article that explains how to avoid applying too little or too much water to a field. The University of Florida’s online agriculture resources features an abundance of informational guides and publications. An article explaining soil moisture sensor irrigation controllers. Describes the different types of flow meters, selection criteria, and maintenance. UC Davis was ranked as the second best university for agriculture sciences in the world. A guide for irrigating corn crops with limited water supply. They also provide guides on Almonds, Olives, Winegrapes, Tomatoes, and other crops here. 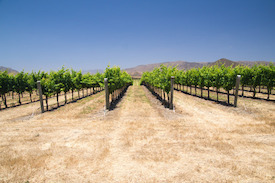 An article describing the typical irrigation methods in California and facts about crop water needs.